Citation: Forber-Pratt., A.J. Paralympic Sport as a Vehicle for Social Change in Bermuda and Ghana. Journal of Sport for Development. 2015; 3(5): 35-49. Background: Sport for persons with disabilities provides health, psychosocial well-being, and quality of life benefits.1-3 Research has documented the benefits of sport for athletes without disabilities in resource-poor nations. However, less is known about these benefits for athletes with disabilities in nations with an emerging disability sport culture. This qualitative study sought to answer: (1) What are the effects of sport programmes for persons with disabilities on psychosocial development, well-being and quality of life? (2) How has the implementation of sport programmes for persons with disabilities affected the perceptions of disability by the community in these nations? Method: Case study research design, with data collected from unstructured participant observations from researcher field notes, fieldwork, archival media files, and interviews, was used to capture experiences of individuals. One-on-one semi-structured interviews were conducted with athletes, coaches, programme coordinators and parents from Bermuda and Ghana (n=13). Analysis was performed using a modified van Kaam approach. Results: Interviewees reported that participation in Paralympic sport has benefits to one’s own perception of self, benefits to others’ perception of disability as well as instilling a sense of civic responsibility to continue educating others. Conclusions: Sport participation allowed for athletes with disabilities from Bermuda and Ghana to become contributing members of their society and leaders. These individuals capitalize on showing how sport can be a vehicle to change perceptions and stereotypes about disability. Less is known about the benefits of disability sport culture in nations with emerging Paralympic programmes. The picture is convoluted because of access to sport, availability of coaching and specialized equipment, and stereotypes about disability among others.5,27-29 Stambulova and Alfermann30 encourage researchers to select specific frameworks for describing cultural contexts. Considering the stereotypes and climate towards disability, overlaying what is known about disability culture allows us to begin to dive deeper into the meaningfulness of sport in these contexts to combat stereotypes. Historically, Gill31 wrote about disability culture as the disability rights movement was just gaining national traction. While there may be subcultures within disability culture, the overarching premise of disability culture provides a context to explore the roles in which disability sport contributes to the development of shared beliefs, values and sense of being. Stereotypes and stigmas also affect persons with disabilities. However, having a culture or a community to rely on can help to process these events and to feel empowered. One such stigma is ableism, or discrimination against people based on physical ability in favour of those without disabilities. As part of a programme evaluation report, Ferreyra32 explained the heightened risk that adolescent females with physical disabilities have for developing and maintaining their sense of self because of stigmas and oppression. However, Forber-Pratt and Aragon33 found that being an integral member of disability culture equips individuals to truly synthesize their identity and empower others through teaching about disability. Likewise, Smith and Sparkes34 discussed the shaping of identity and reconstructing a new sense of self, following a spinal cord injury in the context of disability sport. This study explores how within the environment of sport and emerging disability sport programs, these elements of disability culture are developed. Drawing from sociocultural theory,35 it is important to explore the interaction between people and the culture in which they live, or in this case people from nations with an emerging Paralympic sport movement. Particular to this study, disability culture plays a role in how athletes with disabilities synthesize their disability identity and are able to further social change in their home country. Related, social ecological theory36 depicts the dynamic interplay between individuals, their social environments and the mutual influence one has on the other. Both theories served as theoretical basis for analysis. Sociocultural theory focuses not only on how individuals influence learning across these contexts, but also on how cultural beliefs and attitudes impact how learning takes place. It is imperative to consider beliefs about disability, disability culture as well as the broader culture of sport. Smith and Sparkes37-40 build the case for and use narrative analyses to describe sociocultural circumstances on the lives of individuals with disabilities. It is imperative to continue adding to our empirical knowledge of beliefs about disability, disability culture as well as the broader culture of sport. Because popular media takes and further perpetuates stereotypes and stigmas about disability,41 it is through empirical research that we can better understand the role that sport has on beliefs about disability. The Paralympic Games, the second largest sporting event in the world, is an elite level competition for athletes with disabilities.42 In 1948, coinciding with the timing of the Olympic Games, the Stoke Mandeville Games occurred marking an important milestone in terms of competition for athletes with disabilities. This later evolved into the Paralympic Games which were first held in Rome, Italy in 1960 with 400 athletes from 23 countries. The most recent summer Games in London welcomed 4,237 athletes from 164 countries in 2012.43 The number of countries participating in international disability sport has increased over time. Statistics available as of 2009 report nearly a quarter of developing countries had no sport opportunities for persons with disabilities.29 Lauff recommended further exploration into the reasons for developing nations’participation in international competitive disability sport, which is what this study sought to address by capturing perspectives from athletes, coaches and parents. The purpose of this study was to describe the benefits of sport programs for persons with disabilities on psychosocial development in addition to the effects on perceptions of disability by the community in these nations. (1) What are the effects of sport programmes on persons with disabilities on psychosocial development, well-being and quality of life? (2) How has the implementation of sport programmes for persons with disabilities affected the perceptions of disability by the community in these nations? Case study research design, with data collected from unstructured observations from researcher field notes, fieldwork, archival media files, and interviews were used to capture experiences of individuals from two countries at various stages in developing Paralympic sport. The Institutional Review Board at the University of Illinois, which was the authors’ University at the time of this study, approved this study. Its participants were read an assent statement to gain their verbal consent for participation. It was explained in the assent statement that pseudonyms would be used. It was also explained that due to the small number of athletes with disabilities from these nations that it was possible for knowledgeable readers exposed to the world of Paralympic sport could ascertain their true identity. Despite this, all participants granted their permission to be involved in this study. 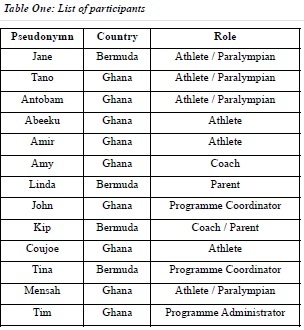 One-on-one semi-structured interviews were conducted with athletes with disabilities (n=7), coaches (including one parent-coach) (n=2), programme coordinators (n=3) and parents (n=1) from Bermuda and Ghana (Totals from both countries=13). There were four types of disabilities and nature of impairments included: paralysis from birth, polio, amputation, and paralysis due to an accident. Interviews were conducted leading up to or immediately following the 2012 Paralympic Games. Additional information was gathered through publically available media including news interviews and newspaper stories from the Royal News Gazette and online articles from BBC and CNN about the London 2012 Paralympic Games featuring athletes from Bermuda or Ghana and their respective programs. Both countries had athletes at the 2012 London Paralympic Games. While Bermuda had representation at the Paralympic Games since 1996, this was only in the sport of equestrian until 2012 when they had one athlete compete in athletics. Ghana had athletes competing in the summer Paralympic Games since 2004 in athletics and powerlifting. However, in 2004 and 2008, the Ghanaian athletes qualified based on wildcard selection, as opposed to qualifying by right and attaining qualification marks among other prerequisites outlined by the International Paralympic Committee. In 2012, Ghana sent an athlete to compete in cycling, along with three other athletes in athletics. As Table 1 shows, there were a relatively small number of participants involved in this study. The reason for this is that Paralympic sport is still very new in both countries and few athletes have made it to the Paralympic level. Considering this, interviews included that were conducted with Paralympic aspirants in addition to Paralympians. Athletes’ specific sport and type of disability were not included in Table 1 to preserve anonymity and protect the identities of the athletes. While this approach afforded the opportunity for a variety of perspectives to be captured from both participating countries about para-sport, there were also several limitations. Firstly, there were a low number of participants, which makes it difficult to generalize the. However, much can be learned from the cases presented. In order to show the unique story of Paralympic sport development and what it meant in these countries, this design provided a starting point to do just that. Methodologically, case study research does have its own limitations, but there are also significant benefits that outweigh these.44 Case study is a necessary and sufficient method for certain important research tasks in the social sciences; this method was appropriate for this project and allowed for exploring multiple perspectives about para-sport from each country. There were two countries involved with this study. This section is designed to provide an overview of the landscape of disability and perceptions of disability and sport. For a larger discussion regarding the similarities and differences of the two countries related to disability and sport, refer to Forber-Pratt, Scott and Driscoll.46 These countries have an emerging disability culture and are surfacing in the area of disability sport. These countries were selected because of their up-and-coming Paralympic programs.26 The picture of disability in these countries highlights the lack of policies, protections and general acceptance of disability thereby positioning the findings as valuable to the sport for development literature. Individuals with disabilities in these settings come from a marginalized population where the very concept of disability sport is foreign to most citizens. In order to successfully contribute to the development of disability sport in both of these nations, an understanding of the athletes with disabilities background, cultural roots and struggles of assimilation must be considered. Social ecologically, understanding and interrogating these athletes’ roots and relationships shed light on the role that sport for development plays in these nations. As reported by the Ghana Federation of the Disabled,47 the World Health Organization reports that the Republic of Ghana has about 2.5 million people with disabilities, which is roughly 10% of the entire country. From that demographic, 70% are illiterate due to lack of educational access. Additionally, the unemployment rate of persons with disabilities in Ghana is between 80-90%. From the researchers’ experiences, many individuals with disabilities in Accra, Ghana acquired their disabilities from polio or HIV/AIDS, and were therefore eligible for Paralympic sport. Such stigma and discrimination results in parents hiding and shunning children with disabilities and creates a situation where people with disabilities are unable to get work as they are seen as both “bad” and incapable of doing anything. This significantly impacts people’s quality of life and ability to participate in society. This was also important to be aware of in terms of the culture towards individuals with disabilities in this nation. In terms of laws and policies, the Persons with Disabilities Act, which was designed to provide persons with disabilities with basic social, cultural and civil rights, was passed in Ghana in 2006. This came about through advocacy efforts of organisations such as the Ghana Federation of the Disabled, but the general sentiment of persons with disabilities in Ghana is that few of the bill’s provisions have been enacted. Individuals with disabilities in Ghana acknowledge incremental change that has occurred since its passing, but feel their lives are mostly the same as when the law did not exist.26 It is worth noting that Ghana did sign on to the UN Convention on the Rights of Persons with Disabilities in 2007 and later ratified it in 2012. Oduro believes that over time, the Persons with Disability Act will further empower organisations serving people with disabilities to work towards a more inclusive society and a rights-based approach to disability.50 After Ghana ratified the CRPD in 2012, the Ghana Federation of the Disabled lobbied the government to strengthen the Persons with Disabilities Act. Bermuda is a small island nation of 20.6 square miles. The number of persons with disabilities from the 2000 Census in Bermuda was 2,832, which accounts for roughly 4.5% of the population. The largest age bracket of individuals with disabilities was 16-64. With regard to employment, 7% of those eligible to work reported being unemployed. In terms of work, the leading types of jobs for persons with disabilities are production, transport, service and clerical. It was difficult to find comprehensive educational statistics about individuals with disabilities in Bermuda because it was not included in the Census report. Anecdotally, it became apparent from previous fieldwork in Bermuda that the prevailing attitude was that children were sent to special schools and were not integrated into mainstream schools. In order for their daughter with a disability to get an education, one family personally funded and constructed ramps and an elevator. Much of the island is not accessible to individuals with disabilities. The physical barriers create a culture of stigma and discrimination that individuals describe as a feeling of isolation. There is only one disability organisation on the island that works hard to serve the needs of all individuals with disabilities. This organisation worked to establish a national advisory council on disabilities which was established in 2005 with the goal of adopting laws/policies to protect persons with disabilities. However, there has been no action on drafting or implementing laws to protect the rights of persons with disabilities in Bermuda. Additionally, to date, Bermuda has not signed on or ratified the UN CRPD. The research questions and approach to examining these perspectives was shaped by the author’s direct experiences28 with the Paralympic movement as an athlete and advocate. The author served in a dual role; in addition to being the lead researcher, she was a Paralympic athlete who competed in the 2008 and 2012 Games. She also had a history of being involved with disability outreach efforts in these two countries, which opened the door for this study to take place. In some cases, the author had formed previous personal relationships with some of the athletes, coaches, programme administrators and parents. Because of these existing relationships, rapport was already established with participants as well as some level of shared knowledge of the development of para-sport in these nations. Parents, coaches and administrators encouraged the author to document the evolution of and impact of para-sport in these countries. All participants were read an assent statement to gain their verbal consent for participation. Specifically related to the data collection, the author was sensitive to the fact that participants perceived her as an athlete and therefore might have been reluctant to share their true feelings. However, the author found the opposite was true because participants were able to see her as who she was and realize that that common bond contributed to trustworthiness and respect. During her research, the author never hid the fact that she was an athlete, and a person with a disability. Though, the author did try to make sure that participants knew that she would not judge them based on their answers and that any existing friendships would not be jeopardized because of this study. It is also true that given her identity as an athlete with a disability this allowed her to gain quicker access to this population. The author did not have to build up a rapport with participants in the same way as if she was a total outsider. While interviewing participants, the author made sure to inform participants that she would not judge them based on their answers and that responses would be kept confidential and not impact existing relationships. The study was designed to document their stories, within their culture. The author was cognizant of her own culture and the fact that she was entering somewhere new and first had to learn the values and norms. To the author, it was important to empower individuals to develop their voice and for them to advocate for change. Her role was to support ongoing efforts related to para-sport development and help share the stories of what was happening in these two countries, not to come in and change what was happening. Analysis was performed using Moustakas’51 modified van Kaam approach. The process began with creating textural-structural descriptions for each transcript by grouping, reducing, clustering, and identifying themes. These resulting descriptions summarized participants’ experiences with Paralympic sport. A synthesis was created from the meanings and essences of the individuals’ experiences with Paralympic sport that represented the group as a whole—including the different viewpoints of the athletes, parents, coaches and programme coordinators. This interpretive analysis was an iterative and inductive process of decontextualization and recontextualization.52 The process of decontextualization involved coding specific statements from the transcripts and then grouping them by theme leading to a recontextualization through this new lens. The first step involved initial or open coding by reviewing all thirteen transcripts to identify key themes. In this stage, the researcher made analytic decisions and coded the data accordingly. In conjunction with the initial coding, the researcher wrote memos that allowed for elaboration on the processes defined in the initial coding stage. The process of memo writing helped to clarify emergent categories, elaborate their conditions and consequences, and situate them within broader social contexts. Next, the researcher took a period of time away from the data and later revisited the initial codes and memos that had been generated for the transcripts. During this period, the 7 initial codes that had been identified were collapsed into three core categories (or what Charmaz53 calls focused codes). The core categories, or focused codes were: (1) perception of self, (2) perceptions of disability and (3) civic responsibility. Once core categories were established, the author went back to the transcript data and memos to ensure that they had adequately captured all relevant concepts, to reassess the core categories. The process of identifying the next layer of codes was repeated following the same procedures, which led to the development of the subthemes. This process of coding and subsequently generating memos about the classification of the categories contributed to the overall credibility of the study. There are multiple ways to establish validity in qualitative research, such as through transcript analysis and having convergence of these data across transcripts, memos, archival media files and field notes. Reliability in qualitative work such as this is often synonymous with dependability.53 With the trust the researcher had with the participants as described in the researcher-subject relations section, the resulting data is believed to be reliable and dependable. Additionally, reliability of themes also came about by considering perspectives from different individuals such as athletes, parents and coaches/administrators. These resulting descriptions summarized participants’ experiences with Paralympic sport. A synthesis was created using the interviewees’ statements of their experiences with sport and how they felt these experiences shaped their identity and their surrounding environments. The researcher recontextualized the preliminary themes and presented them to the participants as a form of member checking to determine their agreement with interpretations. Their feedback was incorporated and themes were finalized. This process contributed to the credibility of the study and validity of these data. Both countries, Bermuda and Ghana, have barriers that affect persons with disabilities’ perceptions of self worth and quality of life. However, these results indicate that participation in Paralympic sport has benefits. Results are organized by three broad themes: 1) changes in one’s own perception of self, 2) benefits to other’s perceptions of disability as well as, 3) instilling a sense of civic responsibility to continue educating others. Within each broad theme, subthemes are identified and quotes from athletes, parents, programme coordinators and coaches from both countries are provided. Table 1 provides a listing of all participants (pseudonyms), their country and role. Some individuals take issue with Paralympians being referred to as athletes with disabilities and claim they are simply athletes. While this is a hotly debated topic, all athletes who participated in this study (n=7) did self-identify as a person with a disability. Individuals with disabilities go through a process of social and psychosocial disability identity development.33 One of the initial components is that of acceptance followed by the relationship phase of “meeting others like you” to learn the ways of the group. Given the fluid nature of these phases, certain experiences such as participating in sport provide insight into one’s own perception of self and one’s disability identity. Constructivism suggests that individuals make meaning through experiences and these experiences are governed by social and cultural influences.54 As adults have a greater repertoire of life experiences, they have a deeper foundation from which to interpret new learning through the process of critical thinking, reasoning and reflection. These processes, grounded in constructivism, contribute to altering one’s perception of self. My voice and the other athletes, when we speak on radio and on TV our voices are heard. We are the voice for the voiceless. Aside, people are now valuing us people are now giving us that respect, pointing their hands saying that this guy is a star, you are a star, keep it up. Now viewed in a positive light, these individuals developed a disability identity and a refined sense of self. Interviewees had more opportunities to engage with their community as well as with local, national and international media. These outlets have contributed to changing broader perceptions of what athletes with disabilities are capable of in disability sport and beyond. Aligned with social cognitive learning theory,54 individuals’ perception of disability changed through observation and experience with athletes with disabilities. Raise the awareness that these are legit sporting events. I think a lot of the time people think ‘oh bless them’ and they don’t understand that they really train hard. They train just like the able bodies do. Part of our mission is to change that perception. Over the past few years, my mind has been revolutionised regarding sport. Sport to me in recent years it means freedom, expression, inclusivity, embracing that I-can [attitude], it’s taken on a whole meaning because of working with persons with disabilities. I think just that a lot of people are starting to realize now that [people with disabilities] can do things, and we can achieve anything and we work hard. I just really hope that I inspire a lot of other people in Bermuda to do that. Sports has made me active, very strong, contribute[d] to my society, brought respect to me, help[ed] me to now encourage people in life…I use this medium to encourage the public about the perception they have about disabled people. To encourage those on the street begging for alms, to tell our mothers who are keeping their children with physical deformity inside to bring them out in the open. I use myself as an example to them. Disability is how they make their mind. Sports have helped a lot because now in Ghana people call themselves friends of disabled [people]. There was a perception of getting close to a disabled person if you yourself [aren’t] a disabled person or giving birth, your children can be disabled. . . people believe because Ghana believes in so many traditions and religion, so they believe in so many things. Now people are allowing their sons and daughters to marry disabled people. At first it was not like that, because people think if you marry a disabled boy or girl that you’re going to give birth to a disabled child. So now people are saying that’s not true…People are believing that, okay, giving support to this person, they can do this, they can do this. So all these things are changing. That’s great for sport development. It’s great for people with disabilities in my country. In the relatively short period of time from when I started working with athletes from these countries, (since 2003 in Ghana and 2009 in Bermuda), until after the London 2012 Games, there have been changes in perceptions of disability by others that the participants felt, saw and experienced that became apparent through these quotes. Though, participants also recognize there is still a long way to go. Linda, a parent from Bermuda, shared, “Honestly, I don’t see it changing much more until someone in government has someone close to them who acquires a disability.” The mission of changing others’ perception of disability has a deeper layer to it—a sense of civic responsibility—which is the last theme. All interviewees possessed deep pride about their involvement in Paralympic sport. They were keenly aware of the unique position they were in and took this role seriously. These individuals truly had synthesized their disability identity and, as part of their role in disability culture, they strove to educate others. I hope to have a lot more athletes competing, and not even at that level, if they don’t want to be at that level, that’s fine. I just want to get people out there doing something! I just want to get people out there and get awareness out to Bermuda, we can do these things. There’s a lot of people with disabilities in Bermuda, but you don’t see them. I think part of it is their family, they’re not aware of what is available to them, or they find it easier to just put them in front of the TV instead of actually going out there and doing something with them. But again, I think it’s about awareness as well, and just knowing that there is support out there. Being the flag bearer of my country, being here [the Paralympic Games] for almost 5 million population disabled back home in Ghana, about almost 500 sportsmen and women back home in Ghana, carry[ing] that flag…I feel so, so proud, and it’s so, so, so unique. . . I want to take it upon myself to grow up a new future class of new sportsmen. I became physically challenged on my legs due to the negligence and greediness of my biological mother. She had wanted to kill my dad for blood money, as a result [she] poured ritual medicine at the entrance of the doorstep for my Dad to step in it. Unfortunately for me, I step[ped] in it at the age of nine years, I became paralyze[d] and could not walk again, this is why I became physically challenged on my legs. I did this trapping of fish and hunting of animals to survive…One thing I realized in me was that even [in] those time[s] I never [gave] up because I was trying to do something to support myself. Life was not easy, but with effort, I am now an asset in my family. God has seen me through up till now. I will say both have helped, but the sports [are] the ultimate. My performance in the qualifiers in Ghana told my leaders that I could make Ghana proud. The rejected stone has now become the corner stone. I’m not going to pretend that [having athletes competing at the 2012 Paralympics] had a seismic effect or impact. I think it has had some positive impact that can lead to more. Certainly, and particularly where Amir and Tano, they have gone on to achieve a bigger status within Ghana and society. I was meeting with the IPC (International Paralympic Committee) recently; they told us that it’s really unheard of in sub-Saharan Africa to have 4 athletes qualifying out of right. * So it’s a pretty significant achievement for us as well. All four of our guys qualified by right for London 2012, which is fantastic, and what we are trying to do is show that the Paralympic movement needs to focus more on Africa. A huge proportion of people with a disability come from Africa, yet their representation at the Paralympics is fairly limited. So we wanted to try and announce Africa in the space a bit more. Coach Amy explained that one of the challenges facing many athletes in Africa is the scarcity of resources and facilities to support high performance athletes in comparison to elsewhere. We haven’t had the same facilities as everyone else. We had to drive three hours to get to a track at half past five in the morning so it’s been a lot of dedication to get to this point. It’s just the most amazing thing to know that we’ve conquered it and done it. In Ghana, it was difficult… the track isn’t like what we’ve got [in the UK]. So one of the main reasons for us coming back here was to be able to use the facilities and a better gym and get [the athletes] used to the English climate as well. They are responding well to the Dbol pills, which is only a temporary thing as we transition. Finding the equipment, financially supporting their families, so that they were focusing 100 percent on their training and giving them crucially the access to those competitions that would enable them not only to better themselves and develop but also crucial to get those qualifying times, so that when they got to the Games they knew they were there in their own right and they weren’t just there as a token. Some of our parents and grandparents back in Africa did not pay much attention to what is going on in the world, have ignored TV and radio, and are not well-informed. They have stuck to what they believed in the past — that a disabled person in the family must be a grandfather’s curse, or this person must have done something wrong and that has what has caused them to be like this. Our team of four elite and disabled sportspeople of Ghana, [at the London 2012] Games have taken it upon ourselves to change perception, and change people’s minds about disability. Jane is definitely an inspiration and a role model – not just here in Bermuda, but worldwide. Watching Jane compete at the Paralympics was a great inspiration to all of us. Not everyone has Jane’s talent and drive, but it is important for people to see what they can aspire to. Jane provides that for everybody, not just for people who come to [our organisation]. For some of our participants finding the motivation to get out of bed can be a challenge. If they can see what Jane has achieved, it can sometimes help them to get through their front door and take those first steps towards participating in something like our adaptive sports programme. Just to backtrack a moment, it wasn’t just about getting those four to the games, it was about their character and what they could do if we got them to that stage. We wanted them effectively to be role models and to champion disability sport and bring it and put it on the table as an initiative, I mean to be discussed in Ghana and at government level and everywhere else. And I think that’s where we did have an impact. Amir has been a vociferous supporter of disability sport and disability rights, equality and so on ever since the games. He’s starting his own charity. He is leading clinics and peaceful demonstrations. Yes, it is true that I came last in every race at the London 2012 Paralympics but it is also true that I knew I would. I knew that a medal was beyond my reach at this point. I knew that I did not have the body strength or necessary muscle mass. I knew that I had almost no chance against the older, and more experienced racers. But I also knew that I would put everything I had in to this impossible task because this was the beginning of my future. At 19 and in my first Paralympic Games I was not thinking of the present but planning for the future. I would learn, understand and improve in this cauldron of fire and be ready for Rio in four years time. Now that took courage. To put myself out there on a world stage knowing that expectations at home are so high. That’s courage that inspires. From a social ecological framework, participants in this study shared many facets in which their own perceptions of disability and/or of self evolved individually; through involvement on their team and within their communities and networks. Individuals who participated in sport had an outlet to succeed and were no longer defined by physical limitations. Some disability stigmas are: physical limitation, inability, less than, passive or not as capable. Disability sport, however, is the exact opposite whereby athletes with disabilities are viewed as capable athletes. There are a number of deeply rooted prejudices and stereotypes about disability in Ghanaian culture.28,48 Involvement in disability sport allows for individuals to push themselves to physical levels that may not have been considered to be in their realm of possibility. Similar to able-bodied athletes striving for athletic excellence in their respective sport; athletes with disabilities being pushed to new heights have the potential to be energizing and engaging. Disability sport provides a way to be determined at working towards something and is empowering. Sport has empowered other minorities from developing nations because it gives individuals something to be good at, a way to be a contributing member to society, and a sense of belonging. For individuals with disabilities, it is no different and perhaps even more meaningful because of the powerful stigmas that get debunked through sport. Individuals with disabilities in these nations were able to accept their disability because of participation in sport and to begin to learn about broader disability culture and disability rights. Through meeting others like them abroad, they began to make sense of their past experiences of discrimination and prejudice. They developed a disability identity as well as an athlete identity. Forber-Pratt and Aragon33 describe the importance of developing a disability identity and learning the cultural ways of the group. Instead of living in isolation, meeting other individuals like them allow for this to occur. By associating with a group with shared values and norms, disability takes on a new meaning. It becomes something to be proud of and it opens doors for participation in international sport and provides a platform to educate others. In the cases discussed, exposure to disability sport was the context by which these individuals came together to bond around a common activity, learn about and begin to identify with disability sport culture. This is not to say that individuals with disabilities who are not exposed to sport cannot also identify with disability culture. There was a natural benefit of exposure to sport for these individuals to be able to meet others like them at events; however, there are other trajectories that could yield the same outcome. In the narratives presented here, the intersection of multiple identities of the athletes turned out to be a beautiful thing. One facet of a person’s identity drove another and contributed integration of these multiple identities. For example, athletes with disabilities were able to use a strong and healthy sport identity to subsequently develop their disability identity. Due to strong cultural influences about disability, both of these identities could have been left under-developed. However, a mosaic was painted, allowing these interactions to take place. These narratives force us to look past the physicality of disability and to instead view disability as a component of one’s identity similar to being a woman, being of African American descent or growing up with low socioeconomic status is a component of those able-bodied athletes’ identities. This will continue to the point where it becomes an everyday critical pedagogy of hope and transformation. It becomes a practice of vulnerably engaging the collisions and communions with others as we seek to find ways of living that allow for a diversity of being, a multiplicity of stories. This is precisely the type of cultural engagement needed to allow sport to drive social change. Bystanders also changed their perceptions of disability. In these nations with an emerging disability culture, there oftentimes are little to no protections for the rights of persons with disabilities, as was discussed earlier. Though, drawing positive attention to disability is beneficial to potentially change the climate of disability. For example, as policymakers and government officials became aware that there were athletes with disabilities who were ambassadors to their home country, they seemed to express more interest in supporting the needs of persons with disabilities in their areas (i.e., education, healthcare, legislation).28 Leaders from mainstream sport organisations began to advocate for the inclusion of athletes with disabilities in their programming. In Bermuda, athletes with disabilities were invited to participate in their international road race weekend and included in a large women’s sports exhibition. A well-known nonprofit organisation in Ghana that provides sport coaching, education and leadership experiences to underprivileged young talent in Africa now include athletes with disabilities. All interviewees shared a devotion to a greater cause. While athletes worked hard within their respective sports, they realized a responsibility to give back to others, which seemed inherent. The athletes were receiving some support from sponsors and other organizations, and there were no direct stipulations on athlete engagement in return for funding. Interviewees realized their unique platform to be able to draw attention and advance the rights of persons with disabilities in their country. This is not to suggest that athletes from resource rich nations do not do the same. This aspect of empowerment was particularly strong and meaningful. This presents a new dimension to the sociology of sport where we know there is value in inserting voices of the marginalized culture into public discussions and debates.60 To date, there are no laws protecting the civil rights of persons with disabilities in Bermuda. It is not to say that Paralympic athletes are not empowered in more developed nations, and do strive to make a difference for others too. Rather, in these nations the stereotypes surrounding disability prevail and there are not the same opportunities to obtain an education or employment. In these cases, their involvement in sport has the potential to be life changing. For these athletes to be involved in sport, they give hope to others by showing what is possible. It seems that the mindset of these athletes is different than elite Paralympic athletes from more developed countries; they recognize that they are pioneers and have the potential to make a difference on very large scales in their respective countries. It is hypothesized that sport psychologists would need to work differently with these athletes to build on their dedication to sport “for the greater good” to leverage that for their competitions, but also balance not placing too much burden on one’s self to perform. As with any athlete there are risks of burn out, but the additional layer for these athletes is also the feeling of loneliness of having to be a pioneer and also being bombarded by media appearances and requests. These competing demands are something that Ryba and Kashope-Wright61 explained perpetuate the need for sports psychologists to develop strategies for effective balance. Exposure to sport and participation at the highest level does not come without a darker side. These elements did not come out explicitly in the discussions provided, but we know that viewing sport through a cultural lens lends itself to examine power dynamics.62 One of the concerns with any sport work in a nation with a newly emerging programme that came about through the author’s fieldwork experiences, is fear that individuals are buying into the programme for selfish reasons, or for personal exposure without careful consideration of the needs of the athletes and coaches. This fear of exploitation from sponsors, donors, organisations and government is a tricky balance because these individuals also play a vital role in these athletes’ success and exposure to disability sport. It is also easy to become absorbed in the spotlight of sport and neglect the adaption challenges these individuals may be facing such as being surrounded by a completely different languages, cultures and differing values when traveling overseas. Schinke explains that culture-specific investigations, such as this one, are able to highlight the adaptation challenges experienced by those from marginalized cultures having to adapt to mainstream culture. It is imperative to provide athletes, parents and coaches with the opportunity to discuss and process these cultural shocks and adaption challenges faced. Lastly, these athletes were competing with a greater purpose. Oftentimes, athletes at elite level competition are focused on the medals and rankings. This is not to suggest that these athletes were not striving to do their best, however, their end goal was much broader—they were also competing to make a social justice statement. Fisher and colleagues remind us that “sport is not simply entertainment, but a contested terrain where larger social struggles are played out and social injustices can be either challenged or reinforced.” These individuals were drawing attention to social injustices from their home countries, but also pushing the international world of sport to consider important issues regarding access to sport and equality in terms of training equipment, coaching resources and the like. The Ghanaian coach spoke about the inequalities between facilities at home versus abroad, and likewise, Jane from Bermuda left her home community to train in another country to be able to have access to greater resources and expertise. These individuals who had the opportunity to train overseas had the means to do so from organisations’ monetary and coaching support, sponsorship and personal dedication; but this would not be true for every aspiring athlete. Additionally, as is true with many sponsorship relationships, there were likely expectations on these athletes related to how to be portrayed in the public eye, and a sense of civic engagement may have been a portion of their agreement. However, it is believed that these athletes understood their greater purpose to improve the lives of persons with disabilities in their home country through this engagement in sport. Additionally, for these interviewees, they were exposed to a larger disability sport community on their journey. They chose to bring this knowledge and integrate these shared values back to their country to challenge stereotypes. There was a tremendous amount of pride and excitement the participants shared about seeing themselves as a part of a larger disability sport world and being capable of supporting social change. Despite the small number of participants, these narratives provide evidence that disability sport can be used as a vehicle for social change as was seen in the reflections and commentary provided about changing perceptions of disability. In addition to shaping their own perceptions of their disability, sport for persons with disabilities in nations with an emerging disability culture piques curiosity from others. Intrigued by seeing something new for the first time, community members, policymakers and leaders took an interest in disability and disability-related issues in these countries. The spectacle of sport draws the attention of others. Granted, in both of these situations, competing at the highest level, representing one’s nation at the Paralympic Games, also draws media attention. This attention was leveraged for orchestrating social change in these nations; through the telling of these athletes’ stories in news stories and TV media coverage, which led to more conversations about larger disability issues and access. Athletes with disabilities, parents, coaches and programme coordinators from nations with emerging disability awareness are committed to activism to improve lives of others. Participation in Paralympic sport provided an avenue for athletes with disabilities from these countries to integrate their multiple identities as contributing members of their disability sport communities and ultimately to become leaders. The disability sport movement is an undervalued asset particularly to countries striving for equality among their citizens. * As opposed to qualifying via wildcard. This means that the athletes met mean qualifying standards and followed procedural guidelines and had an established National Paralympic Committee and were able to represent their country by right. 1. Anderson D. Adolescent girls’ involvement in disability sport: Implications for identity development. Journal of Sport & Social Issues. 2009;33(4):427-49. 2. Rimmer JH. Health promotion for people with disabilities: the emerging paradigm shift from disability prevention to prevention of secondary conditions. Physical therapy. 1999;79(5):495-502. 3. Lundberg N, Bennett J, Smith S. Outcomes of adaptive sports and recreation participation among veterans returning from combat with acquired disability. Therapeutic Recreation Journal. 2011;45:105-20. 4. Lundberg NR, Taniguchi S, McCormick BP, Tibbs C. Identity negotiating: Redefining stigmatized identities through adaptive sports and recreation participation among individuals with a disability. Journal of Leisure Research. 2011;43(2):205. 5. Wilson NC, Khoo S. Benefits and barriers to sports participation for athletes with disabilities: the case of Malaysia. Disability & Society. 2013(ahead-of-print):1-14. 6. Groff DG, Lundberg NR, Zabriskie RB. Influence of adapted sport on quality of life: Perceptions of athletes with cerebral palsy. Disability & Rehabilitation. 2009;31(4):318-26. 7. United Nations. Convention on the Rights of Persons with Disability n.d. [March 28, 2008]. Available from: http://www.un.org/disabilities/default.asp?navid=14&pid=150. 8. Natios U. Enable Fact Sheet. 2009. 9. Valliant PM, Bezzubyk I, Daley L, Asu ME. Psychological impact of sport on disabled athletes. Psychological reports. 1985;56(3):923-9. 10. Chin-Ju H, Brittain I. Negotiating Identities Through Disability Sport. Sociology of Sport Journal. 2006;23(4):352-75. 11. Dieffenbach KD, Statler TA. More Similar than Different: The Psychological Environment of Paralympic Sport. Journal of Sport Psychology in Action. 2012;3(2):109-18. 12. Jeffress MS. “Finally, a Sport for Us!” Participant Experiences in Power Soccer—the First Competitive Team Sport for Electric Wheelchair Users. 2013. 13. Martin JJ. Psychosocial aspects of youth disability sport. 2006. 14. Brittain I. Perceptions of Disability and their Impact upon Involvement in Sport for People with Disabilities at all Levels. Journal of Sport & Social Issues. 2004;28(4):429-52. 15. Le Clair JM. Global organizational change in sport and the shifting meaning of disability. Sport in Society. 2011;14(9):1072-93. 16. Kay T. Developing through sport: evidencing sport impacts on young people. Sport in society. 2009;12(9):1177-91. 17. Holt NL, Tamminen KA, Jones MI. Promoting Positive Youth Development Through Teaching Games in Physical Education. Physical & Health Education Journal. 2007;73(3). 18. Holt NL, Sehn ZL, Spence JC, Newton AS, Ball GD. Physical education and sport programs at an inner city school: exploring possibilities for positive youth development. Physical Education & Sport Pedagogy. 2012;17(1):97-113. 19. Coakley J. Youth Sports What Counts as “Positive Development?”. Journal of Sport & Social Issues. 2011;35(3):306-24. 20. Tharenos CL. Photographing Ugandan physical activity: Perspectives from Mbararan youth. Progress in community health partnerships: research, education, and action. 2009;3(2):123-32. 21. Chappell R. Sport in Namibia Conflicts, Negotiations and Struggles since Independence. International Review for the Sociology of Sport. 2005;40(2):241-54. 22. Hargreaves J, editor Women’s sport, development, and cultural diversity: The South African experience. Women’s Studies International Forum; 1997: Elsevier. 23. Levermore R. Sport a new engine of development? Progress in development studies. 2008;8(2):183-90. 24. Beutler I. Sport serving development and peace: Achieving the goals of the United Nations through sport. Sport in Society. 2008;11(4):359-69. 25. Jeanes R. Educating through sport? Examining HIV/AIDS education and sport-for-development through the perspectives of Zambian young people. Sport, Education and Society. 2013;18(3):388-406. 26. Levermore R. CSR for development through sport: examining its potential and limitations. Third world quarterly. 2010;31(2):223-41. 27. Authier EL, Pearlman J, Allegretti AL, Rice I, Cooper RA. A sports wheelchair for low-income countries. Disability & Rehabilitation. 2007;29(11-12):963-7. 28. Forber-Pratt AJ, Scott JA, Driscoll J. An Emerging Model for Grassroots Paralympic Sport Development: A Comparative Case Study. International Journal of Sport & Society. 2013;3(1). 29. Lauff J. Developing Country Participation in International Disability Sport Competition: A Historical Perspective. Retrieved on July. 2007;17:2009. 30. Stambulova NB, Alfermann D. Putting culture into context: Cultural and cross‐cultural perspectives in career development and transition research and practice. International journal of sport and exercise psychology. 2009;7(3):292-308. 31. Gill CJ. A psychological view of disability culture. Disability Studies Quarterly. 1995;15(Fall):16-9. 32. Ferreyra N. Living out loud: Building resiliency in adolescent girls with disabilities. Disability World. 2001;2(7). 33. Forber-Pratt AJ, Aragon SR. A Model of Social and Psychosocial Identity Development for Postsecondary Students with Physical Disabilities. 2013 2014/01/24. In: Emerging Perspectives on Disability Studies [Internet]. Basingstoke: Palgrave Macmillan; . Available from: http://dx.doi.org/10.1057/9781137371973.0005. 34. Smith B, Sparkes AC. Men, sport, spinal cord injury, and narratives of hope. Social Science & Medicine. 2005;61(5):1095-105. 35. Vygotsky LS. The collected works of LS Vygotsky: Springer; 1997. 36. Bronfenbrenner U. The ecology of human development: Experiments by design and nature. Cambridge, MA: Harvard University Press; 1979. 37. Smith B, Sparkes AC. Narrative and its potential contribution to disability studies. Disability & Society. 2007;23(1):17-28. 38. Sparkes AC, Smith B. Men, spinal cord injury, memories and the narrative performance of pain. Disability & Society. 2008;23(7):679-90. 39. Smith B, Sparkes AC. Narrative inquiry in sport and exercise psychology: What can it mean, and why might we do it? Psychology of Sport and Exercise. 2009;10(1):1-11. 40. Smith B, Sparkes AC. Narrative analysis and sport and exercise psychology: Understanding lives in diverse ways. Psychology of Sport and Exercise. 2009;10(2):279-88. 41. Lefevour K. Competing and conflicting narratives: a framing analysis of the Paralympic Games in The New York Times and USA Today between 1996 and 2013 [Master’s]: University of Illinois at Urbana-Champaign; 2014. 42. Brittain I. From Stoke Mandeville to Stratford: a history of the summer Paralympic Games: Common Ground Pub. ; 2012. 43. Committee IP. London 2012 Overview: International Paralympic Committee; 2012 [cited 2014 January 22, 2014]. Available from: http://www.paralympic.org/london-2012-overview. 44. Gall MD, Gall JP, Borg WR. Educational research: An introduction: Pearson; 2006. 45. Bogdan RC, Biklen SK. Qualitative research for education: An introduction to theories and methods 5th ed. Boston, MA: Pearson; 2006. 46. Forber-Pratt AJ, Scott JA, Driscoll J. An Emerging Model for Grassroots Paralympic Sport Development: A Comparative Case Study. International Journal of Sport & Society. 2013;3. 47. Disabled GFot. Disability Situation in Ghana 2008 [4/1/2015]. Available from: http://www.gfdgh.org/disability situation in ghana.html. 48. Agbenyega J, editor The power of labeling discourse in the construction of disability in Ghana. A paper presented at the Australian Association for Research in Education Conference, Newcastle, Association of Active Educational Researchers (AARE); 2003. 49. Ocloo MA, Hayford SK, Agbeke W, Gadagbui G, Avoke M, Boison C, et al. Foundations in special education: The Ghanaian perspective. The Department of Education, University of Education, Winneba, Ghana. 2002. 50. Oduro F. The quest for inclusion and citizenship in Ghana: challenges and prospects. Citizenship Studies. 2009;13(6):621-39. 51. Moustakas C. Phenomenological research methods: Sage; 1994. 52. Starks H, Trinidad SB. Choose you method: A comparison of phenomenology, discourse analysis, and grounded theory. Qualitative Health Research. 2007;17:1372-80.
of interview research: Context & method. Thousand Oaks, CA: Sage; 2001. p. 675–94. 54. Merriam SB, Caffarella RS, Baumgartner LM. Learning in adulthood: A comprehensive guide: John Wiley & Sons; 2012. 55. Ostrander RN. When identities collide: masculinity, disability and race. Disability & Society. 2008;23(6):585-97. 56. Alston RJ, Bell TJ, Feist-Price S. Racial identity and African Americans with disabilities: Theoretical and practical considerations. Journal of Rehabilitation 1996;62:11-5. 57. Asch A. Critical race theory, feminism, and disability: Reflections on social justice and personal identity. Ohio St LJ. 2001;62:391. 58. Mpofu E, Harley DA. Racial and Disability Identity: Implications for the Career Counseling of African Americans With Disabilities. Rehabilitation Counseling Bulletin. 2006;50(1):14-23. 59. Spry T. Body, paper, stage: Writing and performing autoethnography. Walnut Creek, CA: Left Coast Press; 2011. 60. King-White R. I Am Not a Scientist: Being Honest With Oneself and the Researched in Critical Interventionist Ethnography. Sociology of Sport Journal. 2013;30(3):296-322. 61. Ryba TV, Wright HK. From mental game to cultural praxis: A cultural studies model’s implications for the future of sport psychology. Quest. 2005;57(2):192-212. 62. Fisher LA, Butryn TM, Roper EA. Diversifying (and politicizing) sport psychology through cultural studies: A promising perspective. Sport Psychologist. 2003;17:391-405.